Pasqualina and Gemma want to wish you a Merry Christmas! If you’re looking for unique gifts for your loved ones this holiday season, why not check out Teresa’s Eden Hills Market and support a goat-related small business to boot? 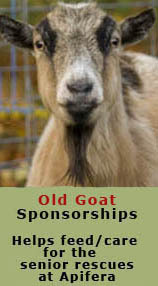 Here’s a great new app for goat raisers: The Goat Spot Forum for both iPhone/iPad and Android. May good luck stardust from Goat Aurora Over Greenland bring you everything you’ve ever wanted!